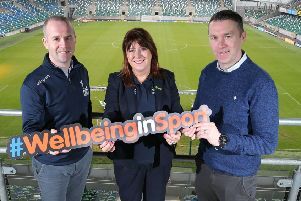 Pictured with Angeline Murphy of firmus energy are (front) Jerome Travers - Rathfriland, Josh Jennings - Dromore Amateurs. Back: Adam Jennings - Dromore Amateurs, Brendan Tumility - Rathfriland. Young footballers, Josh Jennings & Adam Jennings from Dromore and Jerome Travers & Brendan Tumility from Rathfriland have been selected from almost 72 boys across the region to form MUYL’s team for the Foyle Cup tournament this summer. The boys, who play in the firmus energy Mid-Ulster Youth League, have joined the 18-strong squad and have been working hard over the last six weeks and are now ready to make the trip to Derry/Londonderry for the competition where they hope to improve upon last year’s success when the MUYL team reached the Quarter Finals and finished 6th out of 32 teams. Michael O’Kane, from the Mid-Ulster Youth League explained: “The Foyle Cup really is a great experience for all the young footballers as it gives them a taste of a big competition and also is a great confidence booster. “It was such a difficult decision to select just 18 U13 players for our team as we really do have a wealth of talent on offer at the MUYL. The boys had to go through extensive trials so to even be selected for the squad is a great achievement for them and they should be very proud. “This will be the fifth year that we have entered a team into the Foyle Cup and we have to acknowledge that this could not be done without the support of firms such as firmus energy which has been so generous to us over the last year. Thanks to firmus, all the squad is kitted out and ready to kick-off their games really looking the part. Angeline Murphy for firmus energy added, “We have been involved with the Mid-Ulster Youth League since last summer when we also supported their quest for Foyle Cup success. “We were so impressed by the young footballers’ attitudes and enthusiasm, as well as the dedication of the volunteers and organisers behind the scenes, that we committed to supporting the league throughout the year and beyond. The U13 firmus energy Mid-Ulster Youth League team will kick-off the first match of the Foyle Cup tournament on Monday 20th July against Killen Rangers.